A team of researchers has developed a device that uses the material graphene to detect mid-infrared light and efficiently convert it to electrical signal at room temperature. It's a breakthrough that could lead to better communications systems, thermal imagers and other technologies. Published in Nature Materials, the study is a collaboration between the laboratories of Fengnian Xia, Barton L. Weller Associate Professor in Engineering and Science and F. Javier Garcia de Abajo of The Institute of Photonic Sciences (ICFO), Spain. The device demonstrated in this study takes advantage of the unique properties of the highly conductive, atomically thin graphene, which is a single layer of carbon atoms, and its plasmon—a quantum of its collective electron oscillations. "Graphene is a kind of material that can convert mid-infrared light into plasmons and then subsequently the plasmons can convert into heat," said Qiushi Guo, a Ph.D. student in Xia's lab and first author of the study. "What is truly unique about graphene is that the electron temperature rise caused by plasmon decay is much higher than that of other materials"
Graphene's resistance is very insensitive to temperature at room temperature, as a result, it's difficult to electrically detect mid-infrared light except at extremely cold temperatures, which means it can't be integrated into usable devices. 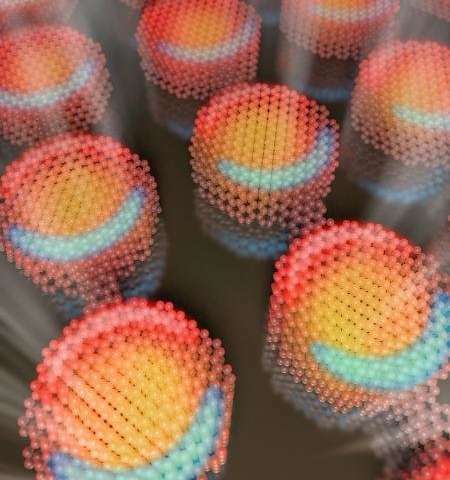 To that end, in this work the researchers developed a new device that features graphene disk plasmonic resonators connected by quasi-one-dimensional nanoribbons. It can effectively detect the mid-infrared light at room temperature. "Our device has artificial nanostructures that convert light into plasmons, and subsequently into electronic heat," Guo said. "Its resistance is also very sensitive to the temperature rise. Unlike that in graphene sheet, in narrow graphene nanoribbons, electron transport depends strongly on electron's thermal energy." What's more, Guo said, is that the device responds very promptly to the mid-infrared radiations. "Existing room-temperature thermal sensors in general have a large heat capacity and well-designed thermal insulation structures. They usually take milliseconds to heat up. But for graphene, it can be superfast—one nanosecond, or just 1 billionth of a second." This makes the graphene detector highly suitable for high-speed free-space communication applications in mid-infrared, which is beyond the reach of conventional microbolometers operating at room temperature. The device is simple and scalable. Remarkably, the device footprint can be even smaller than the wavelength of light. "It offers many new opportunities in mid-infrared photonics," Xia said. "Building a high resolution mid-infrared camera with subwavelength pixels, for example, or to be integrated on photonic integrated circuits to enable mid-infrared spectrometers on a single chip." Thermal images have not followed other electronics and imagers and dropped in price much. If they can replace bolometer-based imagers that cost five-figures for VGA resolution, it would be good.